For some reason driving lessons came to me this week and what it was like learning to drive a car. Coincidently, my 17 year old is doing the same. We are two different beasts, or maybe not. I am trying to relax and enjoy the ride; after all I am paying a fortune for the gas. A man, I can only call “Mr. Sweating” was my “behind the wheel” instructor in high school. He was a nervous sort. If memory serves me right, my friends, Lisa and Scott piled into the car with me; back then we did everything in groups of 3-4. I think Mr. S was a P.E. teacher who was forced at gunpoint to teach driver’s education. He reluctantly went over all the features of the car much in the way one would revel in eating earthworms for breakfast. The only thing on my mind was getting the steering wheel of that government issue car in my hot little hands and thinking as a side note “the brake is there in the middle… what a peach…ok, I can do this.” As we hummed along a little winding back road in Petaluma (turning left from Corona Road to Adobe Road, I picked up a little speed). I could hear Scott whispering to Lisa in the back seat that I was driving too slow or words to that effect. I hit the gas, imagining in my mind’s eye flying over the next hump in the road. I looked over to Mr. Sweating. He was wincing and shifting in his seat with his foot positioned like a hovercraft over the instructor brake . “You can let up a little” he shouted as we approached a bluff in the horizon. Scott and Lisa stopped giggling. A mama quail appeared on the road in front of us with 13,000 baby quail behind her and my first reaction was to hit the brake as hard as I could, sending the car into several dove tails and swerving motions that put us on all points of Old Adobe Road, luckily with no traffic behind us or coming from the other side of the road, I ended up on the side of the road or therebouts. Mr. Sweating exited the car stomping his feet, demanding that I get out of the car into the back seat. With the veins in his neck standing promptly at attention, he shouted in his best boot camp voice “NEVER….ever….NEVER….brake for animals while driving a car!! 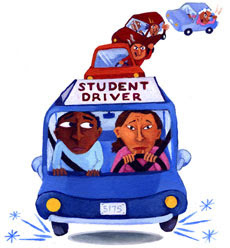 !” After that incident, although totally humiliated in front of my friends, I eventually passed my driver’s test. Secretly, I rejoiced that I had not massacred the quail family that day on Old Adobe Road. Shannon is a much more conscientious driver than her mom. So I try not to hyperventilate as she talks her way through whatever route she is driving. More worried about others than herself, she wonders if she is driving too fast or too slow. I try to keep my comments to minimum, knowing how considerate she is, advising her that the honks and shouts of others mean nothing when it comes to driving safely. Last Friday, in a twist of fate, that delivered me promptly back to 1978, I was driving us all home on Bass Lake Road when the kids and I spotted a lovely young turkey Mom and 4,000 little turkeys trailing behind her as they m ade their way across the road. Slowing down, we laughed at them as they entered the grassy area when not 50 feet away, a mama duck and eight little tiny ducklings were also doing the same thing. Forgetting Mr. Sweating…and coming to full stop in Bass Lake Road. I put on my flashers and told my kids to stay put. I stopped the car coming from the opposite direction and shooed the whole family across the road (with one little guy overturning on his back, but eventually making it to the other side). In the spirit of Robert McClosky, I secretly looked up to heaven and told Mr. Sweating that if it was safe to do so, I would always and forever, make way for ducklings. MMMMmmmm Road Kill! Fire up the BBQ.